I have sometimes heard people say, “Ancient Greek is the most precise language in the world.” This usually comes from people who have not studied Greek for themselves and haven’t really seen its quirks first-hand. I don’t know how best to respond. True, there are distinctions which Greek makes that English doesn’t make, but in turn there are distinctions English makes which Greek doesn’t make. (For example, “I said” and “they said” would both be expressed εἶπον [eipon] in Ancient Greek, since the first person singular and third person plural look identical in certain tenses.) As long as the idea of overall precision is left undefined, it’s not really possible to measure whether or to what extent one language is “more precise” than another. Now if the speaker had said, “Greek has a very large vocabulary and a tendency to coin new words by adding them together, which gives Greek writers greater potential than, say, Latin writers, to choose terms which clear up ambiguity,” I would probably agree. But I would also say that the Greek language as used by real writers in real literature still presents difficulties, because a number of core vocabulary words have a wide range of meanings that cannot be precisely pinned down to one or the other sense. Does δεινός [deinos] mean terrible, fearful, or clever? Marvellous, powerful, dreadful? It’s a shifty word, for sure. And that’s not a bad thing; the word is expressive and evocative. It’s just hard to claim that Greek is “precise” when some of its most common words have dictionary entries that go on for pages. But all natural human languages are like that. If you want a precise language, learn binary, or C, or some other computer language. Greek is not mechanical; it was a flourishing, living language in its day. The same goes for Latin, English, Chinese, or any naturally-formed human language. In any case, let me share with you something that I find quite impressively “precise” about English, after having studied Latin and Ancient Greek. How many tenses do you think English has? Three? English has twelve tenses. Twelve clearly-marked tenses. 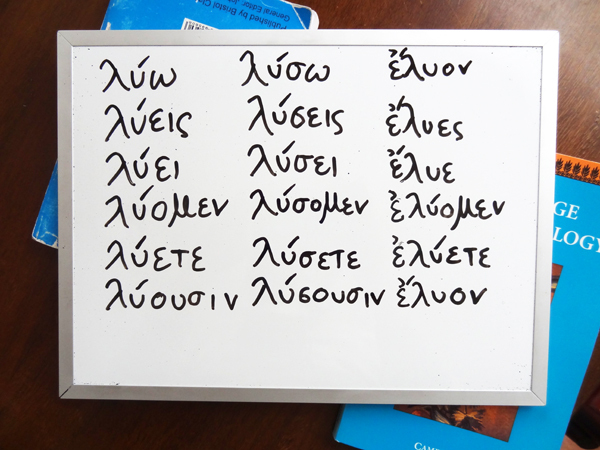 That’s approximately double the number of tenses which are available in Greek (which has seven) and Latin (which has six). Ancient Greek and Latin do not have specific markers for the perfect continuous aspect. With a total of three time periods and three aspects, the maximum number of tenses Greek could have would be nine, but in fact it has only seven. This is because there is no outward distinction between the present simple and the present continuous (“I write” vs. “I am writing”), nor the future simple and the future continuous (“I will write” vs. “I will be writing”). When compared to the grid-like, fully-furnished table of twelve English tenses, the layout of Greek verb tenses seems oddly uneven. I don’t say this to denigrate Greek at all – the language makes up for it in the number of participles it provides. But it is kind of awkward that only the past tenses distinguish between all three aspects. Latin has an even more awkward layout of tenses. The form of the simple past (scrīpsī, “I wrote”) – usually termed the “aorist” in Greek grammar – also stands in for the present perfect (scrīpsī, “I have written”). Since the same forms are used for both senses, this two-timing tense is usually known by just one name in Latin grammar, the “perfect” tense. I’m not pointing this out to pick on the Classical languages. I just find it fascinating that English speakers, when learning Greek and Latin, feel as if they are learning so many new tenses when in fact English has about double the number of tenses, and an extra category of tense-aspect to boot. English grammar is almost never taught in depth to native English speakers, so most natives are not consciously aware of these subtle distinctions in their own language. It seems that students only seriously study grammar when they have to learn it in a foreign language, especially Greek or Latin. That gives people the impression that the language they are trying to learn has greater grammatical complexity than their native language, even though this may not always be the case. In general, I find that native English speakers tend to look down on their own language when they compare it to other languages. I feel that this reflects badly on us English speakers. We fail to appreciate grammar in our own language simply because we can’t see it, because it’s not studied, and because we dismiss our native language as ordinary and humdrum. I love Greek and Latin grammar, but I wish I knew enough English-specific grammar to love English grammar the same way. As a final note: I think some people might object to my assessment of tenses. Some might say that English uses several words to express all of its tenses – words like “have”, “be”, “been”, “will” – and perhaps they might feel that compound tenses aren’t legitimately tenses. To them I would say that Ancient Greek and Latin also use verbs with more than one word in them, particularly in the perfect and pluperfect passive. If this exercise had been done in the passive, I would have included those forms as representative of a distinctly marked tense. And some might want me to include the periphrastic future in Latin: scrīpturus sum (“I am going to write”). But if I were to include that, it would also be fair for me to include the English “I am going to…” future. I don’t feel like that form is major enough to be considered a standard tense alongside the others that everyone talks about. Greek words for love, in context – a post in which I found that, contrary to popular opinion, there are more than four words for love in Ancient Greek; that the differences between ἀγάπη [agapē] and φιλία [philia] are overstated; that ἀγάπη [agapē] is not, intrinsically, a more virtuous love as it is also used to describe sinful desire; that the word ἔρως [erōs] is barely found in the bible at all, and in Plato’s Symposium it was used to describe something deeper and more civilised than carnal attraction; and more. Posted in Ancient Language and tagged Ancient Greek, aspect, English, grammar, imperfect, Latin, perfect, pluperfect, tense, verbs. Bookmark the permalink. Latin students bewildered at how many tenses of Latin verbs you have to learn – take heart! If you speak English, you already know twice as many. Speaking as another Classics graduate with a professional interest in English grammar, I strongly endorse what you say about the dangers of making subjective comparisons between languages. I would suggest that Latin might look more precise because it puts so many more meanings into morphological form (endings) than English does, with the result that it says the same things in fewer words. Perhaps “efficient” would be a better description than “precise” – except that brevity often seems to be at the expense of the subtlety you mention.